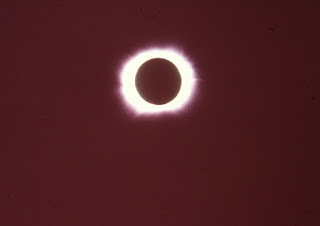 Total Solar eclipse, photo on 35 mm slide film by yours truly in February 1979. In my fifty-odd years of adult life I have had the opportunity to experience two total solar eclipses within a day's travel of where I was living. For the first of them—on March 7, 1970 along the east coast of the US—I owned a car and could have easily made the 500 mile drive to get to the zone of totality. But I didn't. I stayed home at Penn State U and saw the overcast sky dim for a while. Skipping that opportunity was a mistake that I'll always regret. Yet I didn't know how much I regretted it until I *did* witness the total solar eclipse of February 26, 1979 near Williston, ND (photo up top—I was living in Fort Collins Colorado at the time). Here's what the landscape looked like just moments after totality ended, during the 'diamond ring' phase, captured as best I could with my simple 35mm camera with no wide angle lens. That experience was so moving that I vowed I'd not miss the next opportunity. And here it comes. This will be the very next eclipse to occur in the United States since 1979. On August 21, 2017, sights like the above will be within a day's drive for Americans from coast to coast—Oregon to South Carolina. 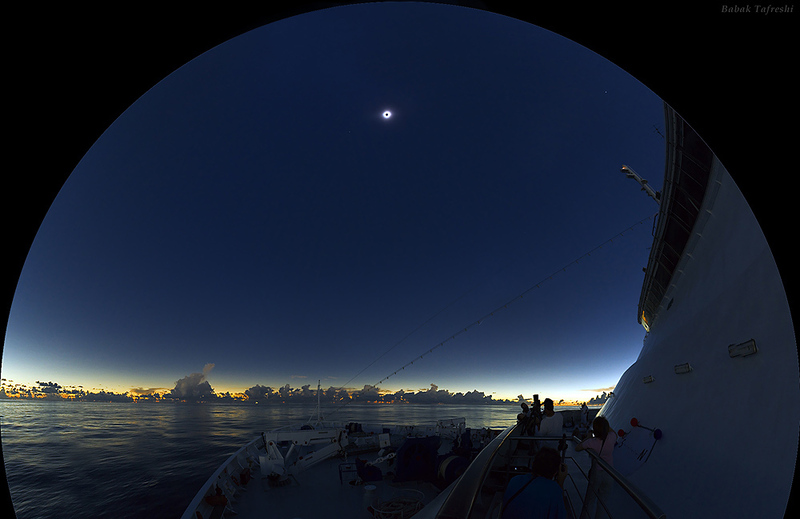 Visit NASA's eclipse web site for all sorts of details. I urge you to put it on your bucket list. Total solar eclipses are among the rarest and most intense visual phenomena this planet has to offer. Many people plan vacations just to see them. One great way to tap into the wild beauty of this event would be to take it in as part of a section hike of America's foremost hiking trail, the Appalachian Trail. 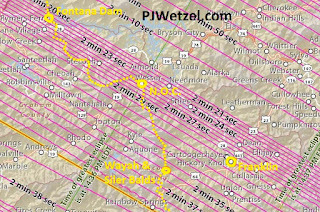 The path of totality will be visible along a couple hundred miles of trail, and there are any number of excellent view points. Here's an overview map, probably too detailed to see easily. 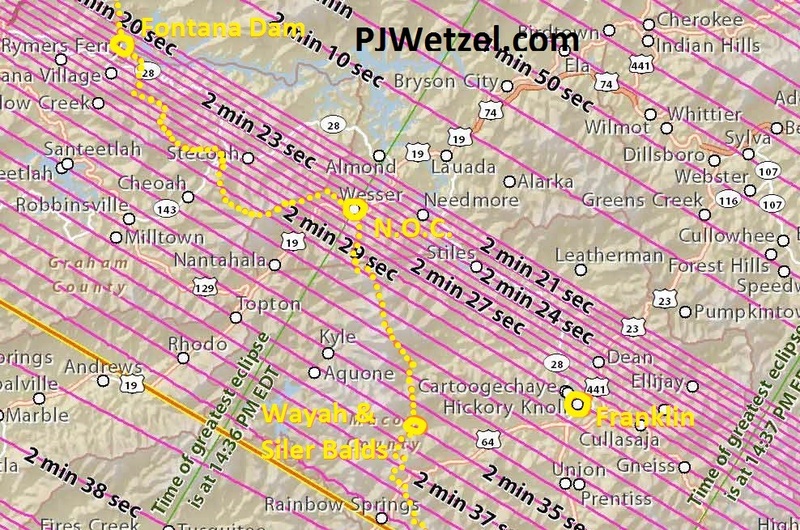 Totality will not be visible from the southern terminus of the trail at Springer Mountain, GA. But you'll enter the zone after 22 miles of hiking, at about two miles north of Woody Gap. The first good viewpoint would be six more miles up the trail, from the rocky outcrop next to the stonework hiker shelter on top of 4500 foot Blood Mountain. For day hikers this is a rugged (steep) 2.5 mile hike up from a big parking lot at Neel Gap, and there are services right there at the Walasi-Yi hiker hostel and store at the gap. Next good viewpoint is five miles the other side of Neel Gap (some call it Neel's Gap. 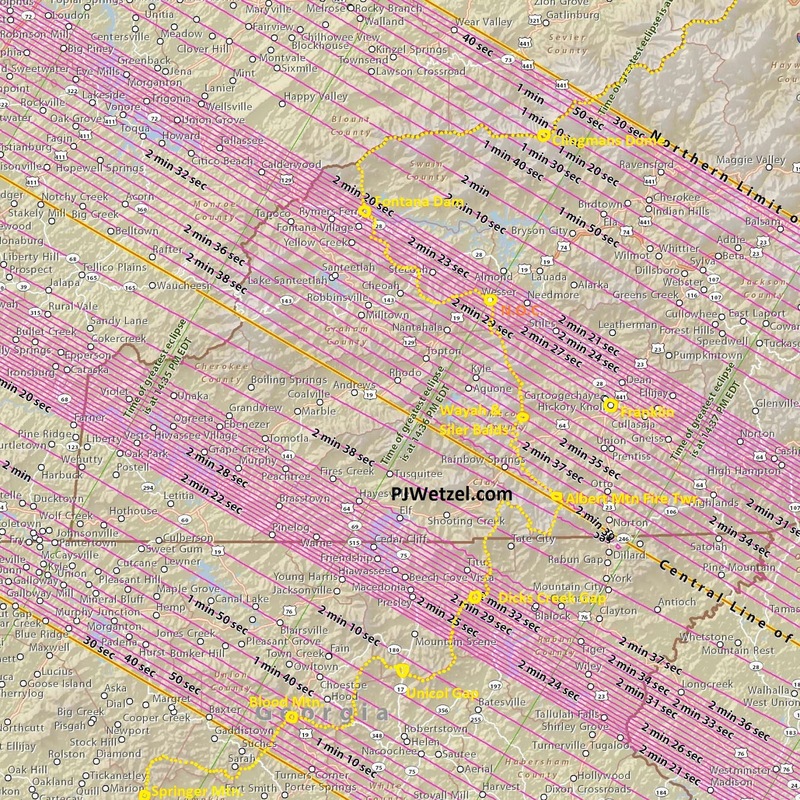 Either way, it's named after a USGS surveyor who bullied his name onto the map because he drew it. 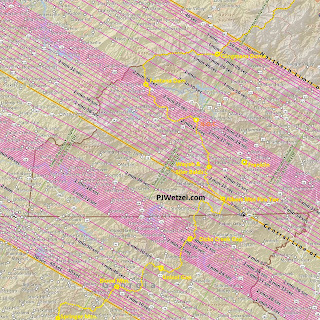 The proper local name is Walasi-Yi, or in English, Frogtown Gap). 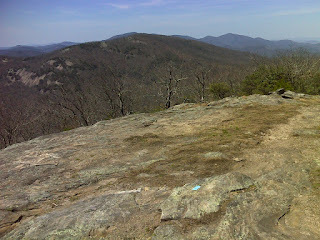 This is another wide open rock outcrop on top of Cowrock Mountain, and another mile and a half up the trail, beyond Tesnatee Gap and just before Hogpen Gap is Wildcat Ridge. From here there aren't a lot of great panoramic viewpoints that I can remember through the rest of Georgia, though when you get out onto the road at Unicoi Gap or Dicks Creek Gap, you'll find decent views of the sky. 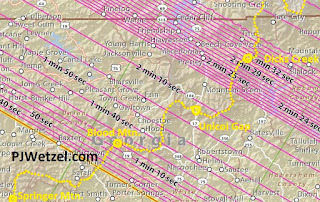 In southern North Carolina, which you reach after 75 1/2 miles of trail, you'll get into the area of the maximum eclipse. 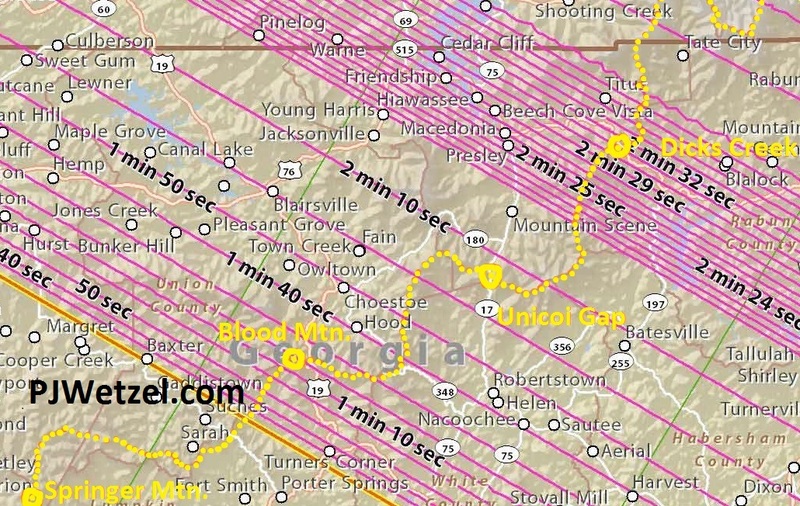 Here you'll have a selection of several decent viewpoints, including Standing Indian Mountain (nine miles north of the GA/NC border) and Little Ridgepole Mountain (seventeen miles). 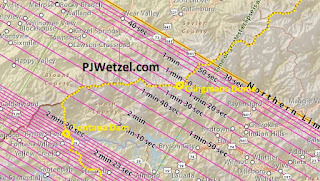 Right on the centerline of the maximum eclipse is the old Albert Mountain Fire Tower. 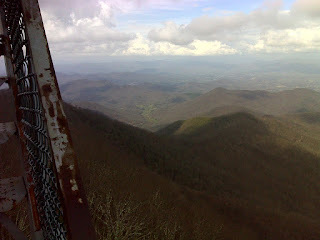 View from Albert Mountain Fire Tower (21.5 miles north of the GA/NC state line). Big Spring Gap shelter is within a mile farther north. 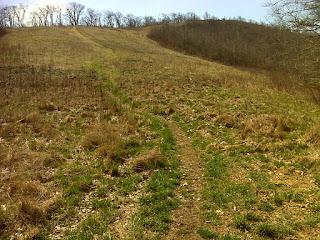 Farther up the trail is Winding Stair Gap and the highway down to the welcoming trail town of Franklin. 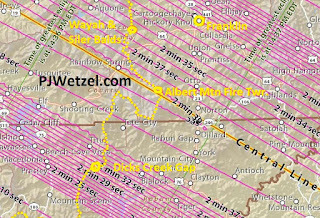 There will be a great view of the eclipse from town, and you can get a motel room and make it a zero day, dedicated just to the eclipse. Four and a half miles north of Winding Stair Gap is a short side trail up to beautiful open Siler Bald. It's a really pretty spot. There's also a shelter near there. Another six miles of trail brings you to the Wayah Bald observation tower. This 'bald' is now overgrown with forest, but there are good views around the tower area. The next two viewpoints north are lowland spots, the Nantahala Outdoor Center, which is as famous for white water sports as for hiking, and Fontana Dam, at the edge of Great Smoky Mountain National Park. 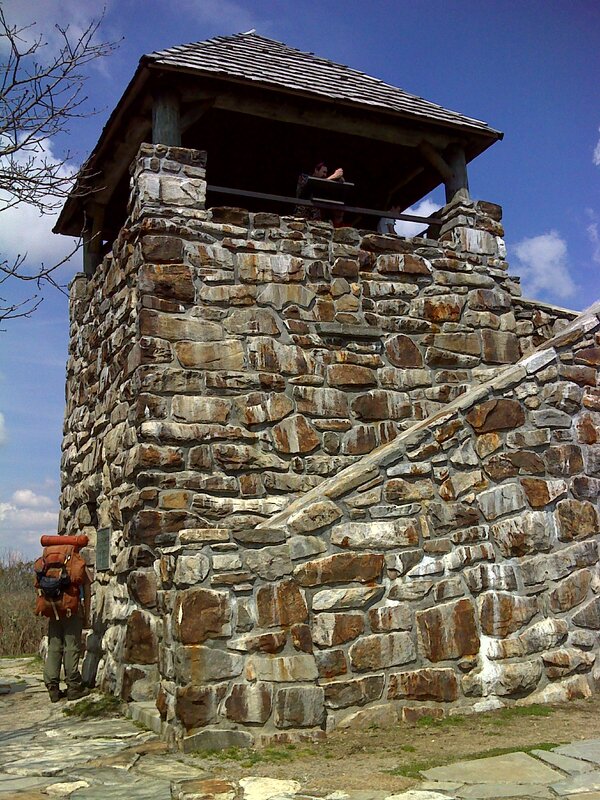 Once you enter the national park you will have hiked about 160 miles from Springer Mountain. 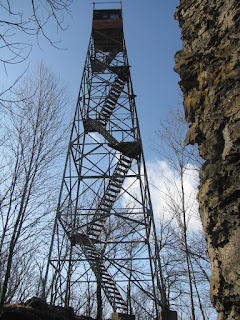 After climbing for about five miles you'll have an opportunity to climb rickety old Shuckstack Fire tower. And then there will be views along the ridge on the border between NC and Tennessee. 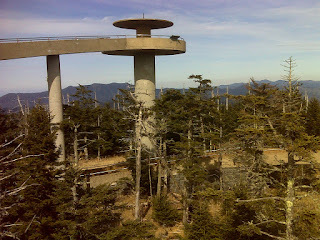 Last of these views before you leave the zone of totality in the vicinity of Charlie's Bunion, is the popular (and likely crowded for the eclipse) tower on top of Clingman's Dome. What about the weather? Well, unfortunately the high ridges on a summer afternoon are places where billowing cumulus clouds frequently form. Weather is hot and humid this time of year and the iconic 'Great Smoky' haze will also be abundant even if the clouds hold off. Climatology says that there is about a seventy percent chance of cloud cover at the time of the eclipse, about 2:30 in the afternoon Eastern Daylight Time, at that time in August. If you prefer a better chance of clear sky, I'd head out west to the Great Plains of Nebraska, even as far as Wyoming. This eclipse will be only the fourth one to cross the Appalachian Trail since it was opened. The first was on January 2, 1925, which passed through Harriman State Park NY. The trail between Bear Mountain and Arden NY opened Oct 7, 1923, and the eclipse encompassed the entire length of the Appalachian Trail as it then existed! Guaranteed *that* will never happen again. The next total eclipse singed part of the White Mountains of New Hampshire on August 31, 1932. Trails had long been in place there, known by other names. They would become part of the AT, but since the AT wasn't officially completed until 1937, I don't know the status of the White Mountain trail system during those years. Finally there was an eclipse that crossed Southern Maine on July 20, 1963. After that there has been a half century wait until this summer's event. 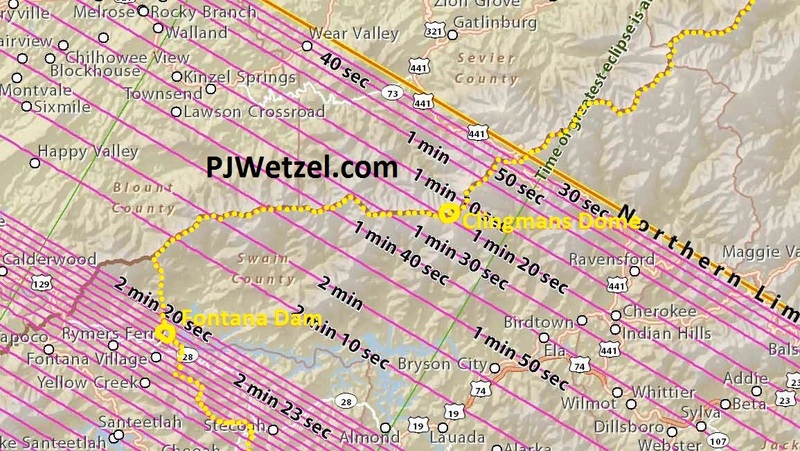 If you're wondering what's next, there's a major US eclipse across the SE and Midwest on April 8, 2024, and that will cross the AT at its northern terminus on Katahdin and will be visible from Whitecap Mountain and the hundred mile wilderness. If you miss that one, you'll have a long wait. 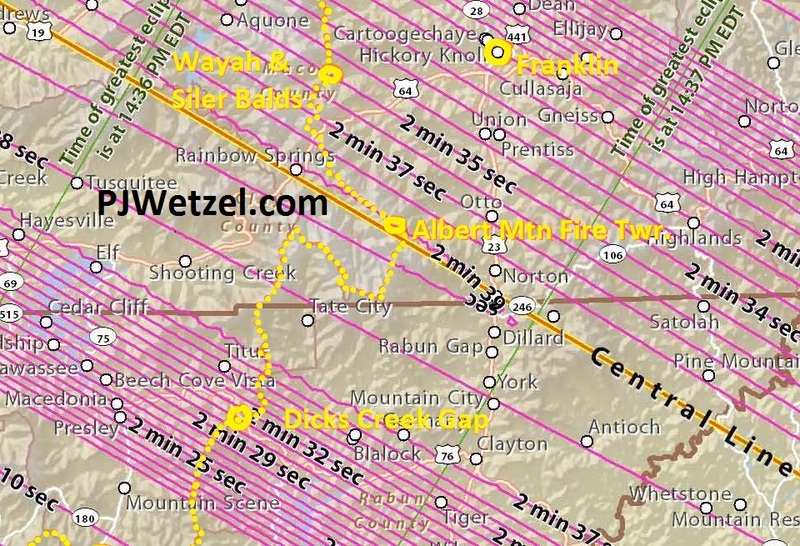 The next time an eclipse crosses the AT will be on Sept. 14, 2099 in Central Virginia. Wherever you decide to go, I know it will be a memorable experience. Good luck with your viewing. 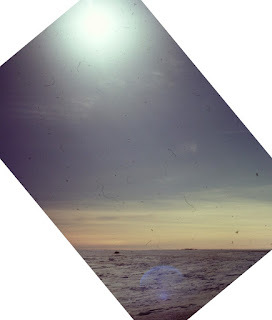 Maybe I'll see you out there.